Tripods sound simple, but actually they have a lot of hidden bells and whistles on them that are not obvious to find, at all. Here are some simple instructions for how to properly set up a tripod. Tip: Do not put your camera on you tripod until you have fully set it up first. #1 – How Tall Does It Need To Be? First thing to do is to figure out roughly how tall your tripod needs to be to take your picture. If you don’t know exactly, that’s ok. Just guess for now to get a start. Grab your tripod, if it’s a bigger one, use one of your legs to help brace it. 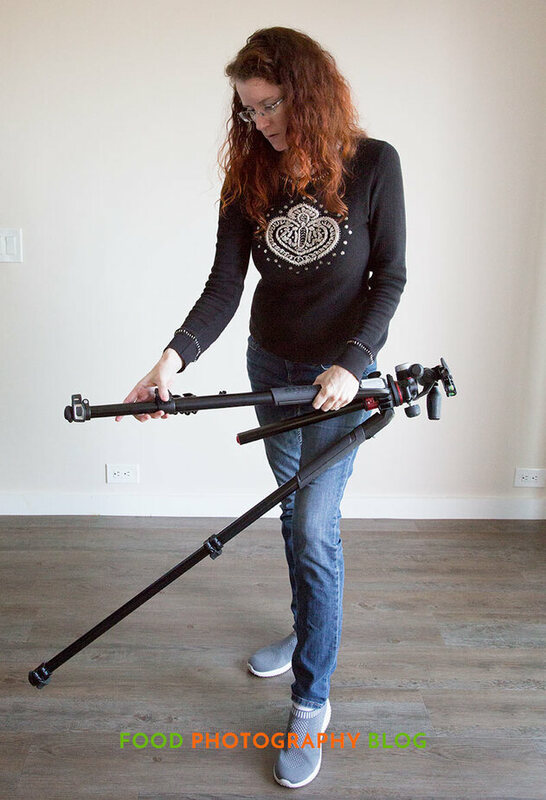 Keep the tripod legs almost closed, then extend each leg one at a time to the same length. Keeping them together while you extend the legs helps to make sure they will all be the same length, keeping your tripod level. Push the legs out and set it on the ground. Tip: If you are going to do an overhead shot, you will need to extend the legs longer than you think, because you will also be spreading the legs out much further to accommodate the legs getting around your surface. Most tripods these days use these quick release plates. I call them Quick To Lose Plates – they’re very small and easy to lose. On the bottom, they usually tell you where the lens should be in relation to the quick plate being put on. 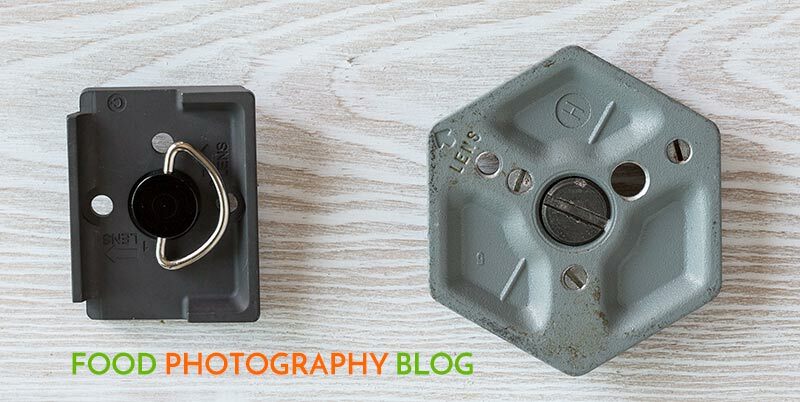 If you haven’t done so already, attach the quick release plate to your camera, paying attention to where the lens is. Once the quick plate is securely in place, while you have one hand solidly holding your camera, snap it back into the tripod head. DO NOT RELEASE YOUR HAND YET THAT IS HOLDNG YOUR CAMERA. Tip: Many tripod heads have quick plate locking mechanisms that seem like it takes a PHD to figure it out. 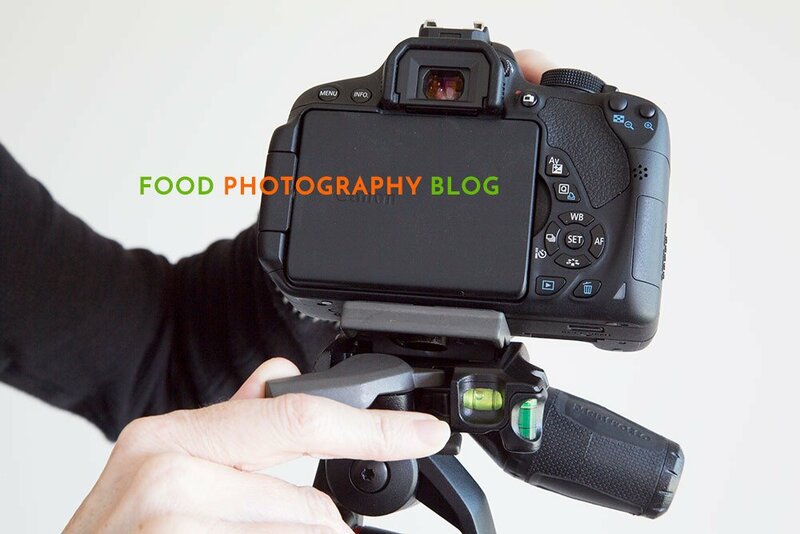 ALWAYS keep a solid grip on your camera with one hand when mounting it onto the tripod head. Some tripod heads have metal pins that have to be pushed down by the quick release plate in order for the lock to slide in place. If you don’t push these pins all the way down, YOUR CAMERA WILL FALL OFF! Another Tip: If your tripod is a few years old, the quick release locking mechanism/pins can stick, so you might have to nudge it with a screwdriver. #5 – Make Sure Your Camera Is Secure! 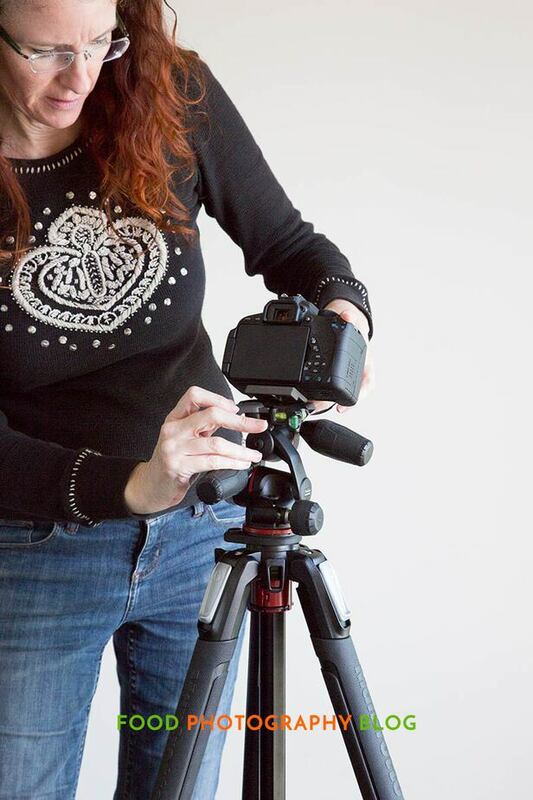 While your hand is still holding the camera, give it a good shake to make sure that thing isn’t going anywhere – it may seem it’s in place, but if that quick release locking mechanism isn’t 100% set in place, your camera can come off. About half the time, I will think the camera is secure and it’s not! Kneel down and adjusting one leg at a time, carefully loosen a leg, extend it to what you think you need, then lock it. Do this two more times, trying to keep each extension the same. Always have one hand on the tripod at all times. If you are doing an overhead shot with a tripod that does not have a 90 degree moving center column, click here to read that post. My next post will cover how to set up for an overhead shot using the Manfrotto tripod that has a center column that goes 90 degrees. If you like this post, please share it on Facebook using the share buttons below, and sign up on the right column to make sure you don’t miss another post. Really good tips. I love the quick to lose plate, hehe. One thing I do if I’m just slightly short or tall of where I need to be (in the 2” range) I make adjustments using the center column. Easier and safer once the camera is mounted. I have a heavy duty tripod so stability isn’t too much of an issue. Hi Rhonda, absolutely a great way to raise the tripod if your center column can go the height needed. I need to add this to my blog post as I totally left that out! SO, I am just getting started and I just invested in a good camera and lens (Canon Mark III and 100mm lens) and really cant afford any more equipment right now. I have a very old tripod that still has the screw in mount and it doesn’t seem to be able to hold my camera vertically so I can take vertical pictures. Any tips or suggestions?? 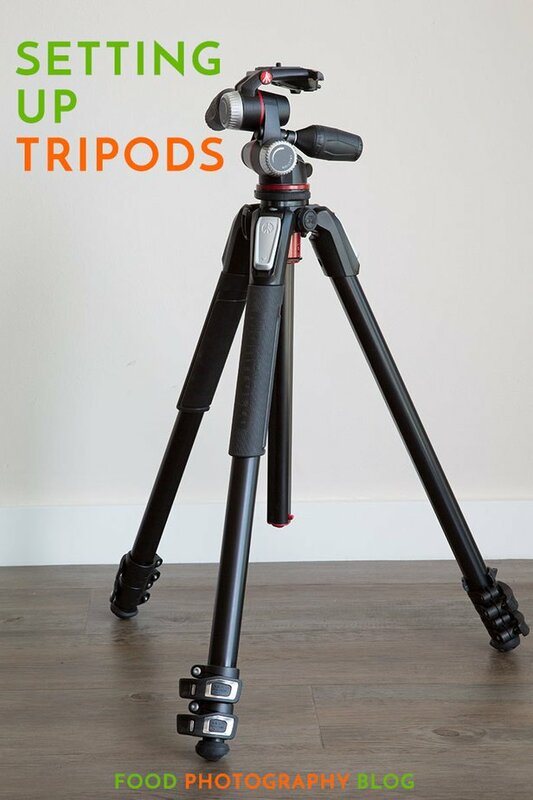 Hi Kiki, it sounds like you have a tripod made for video only, which would explain why it can’t turn vertical. There are not ways around this unfortunately unless you can remove the tripod head and put a different head on the tripod. That would be your only option. If that can’t happen, then you’ll need a new tripod I’m afraid.